How do I add new licences to my Vodafone Cloud Services Marketplace account? 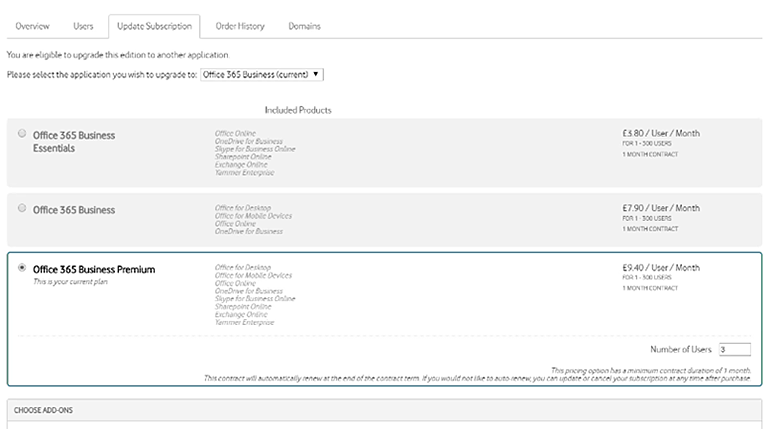 Choose the product or service you want to update (in our example, it’s Office 365 Business Premium) and enter the new total number of licences you want for your organisation. So if you already have one licence and want to add two more, enter the total as three. When you add your new licence(s), a credit will show. This is a pro-rata credit for the cost of the original number of licence(s) for the period between the date you added the licences and the next billing date. This fee will be incorporated into your next month’s bill. We’ll also tell you what your new monthly charges will be for the new number of licences going forward. Now you’re ready to assign the new licences to Users within your organisation. Please note: If you add licences without assigning them to Users, you’ll still be charged for the cost of that unused licence.